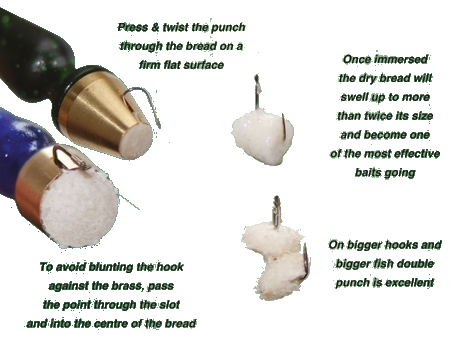 Punch bread is made of small pellets of sliced bread with a special tool called a bread punch (from good tackle shops) they come in different sizes for hook sizes 16,18,20,22. Punch bread is a good bait for shy biting fish on canals or stillwaters will catch small roach, used with light tackle and small floats fished at close range. Punch bread can be used with liquidised bread as a ground bait, to use your punch take a slice of bread and place it on a flat surface eg; bait box lid select the size punch to the size of hook you are fishing with and push into the bread, the small pellet of bread is inside the punch, hook your hook into the pellet though the groove in the side of the punch and pull the pellet out, you now have a punch bread on your hook ready for casting gently or shipping out on the pole.